Let the good times begin with this incredible meal assortment. 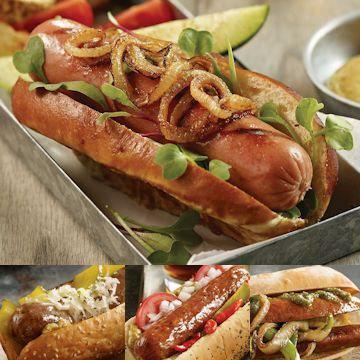 You're going to love serving up our Gourmet Franks, our traditional Polish Sausage and Bratwurst, plus our all-natural smoked Italian Sausage. This is the ultimate gift pack for family reunions, block parties and picnics at the park. Order yours today! Boil: From Frozen or thawed, boil franks for 8-10 minutes. Grill: Grill franks over medium heat until brown on all sides. Frozen franks will cook in approximately 15 minutes. Thawed franks will cook in approximately 8 minutes. Microwave: Place frank on a microwave safe plate. Cover with paper towel. For one frank, cook on high for 1 ½ -2 minutes, if frozen and 1 minute if thawed. Thaw in refrigerator. Grill: Grill over medium high heat for 8-10 minutes Stove-Top: Pan fry in skillet over medium high heat 12-14 minutes. From Frozen: Stove-Top: Boil in sauce pan, from a frozen, 14-16 minutes and 12-14 minutes if thawed. Microwave: Microwave from frozen on medium high power for 2 - 2 ½ minutes. From Frozen Or Thawed. Boil: Bring 1½ quarts of water to a boil in a pot. Remove desired number of sausages from packaging and add to boiling water. Boil for 8-10 minutes if sausages are thawed or 10-12 minutes if sausages are frozen. Grill: Preheat grill to medium heat. Remove sausages from packaging. Grill over medium heat approximately 6-8 minutes from thawed and approximately 12-15 minutes from frozen. Microwave: Remove sausages from packaging and place on a microwave safe plate. Cover with a paper towel. Microwave on HIGH for 1 minute from thawed and 1 ½ to 2 minutes from frozen. From Thawed: Grill: Preheat grill to high or prepare coals. Remove sausages from packaging. Grill thawed sausages for 5-6 minutes constantly rotating sausages. Broiler: Preheat broiler. Remove sausages from packaging and place on broiler pan. Broil for 6-7 minutes turning once at 4 minutes. Microwave: Cut slit in the top of the packaging of sausages. Place in microwave and heat on high for 3 - 3-1/3 minutes for 4 sausages. Let rest 1-2 minutes. Remove from packaging and serve. Ingredients: Pork, Contains 2% or less of Sea Salt, Natural Spices, Diced Green Bell Peppers, Diced Red Bell Peppers, Paprika, Turbinado Sugar.